I find it somewhat ironic that I rarely cook from recipes yet my cookbook collection is out. of. control. From foodporn cookbooks where I’m unlikely to even attempt a recipe and just drool over the pictures to food-specific cookbooks that I’ve used as an introduction to a new style of cooking, I’ve got them all! My very favorite cookbooks transport me into the kitchen of the author and reading them is like a conversation between two old friends over the kitchen counter. Readability: What’s the style of the book? Are the directions clear? What’s the voice of the author like? Recipe difficulty: If someone is fairly new to cooking, would they understand most of the recipes and be able to make them? If a recipe is “difficult” that doesn’t necessarily mean it’s a bad thing. Photography: Are there pictures? Do they help you with the recipe? Does the food look appetizing? 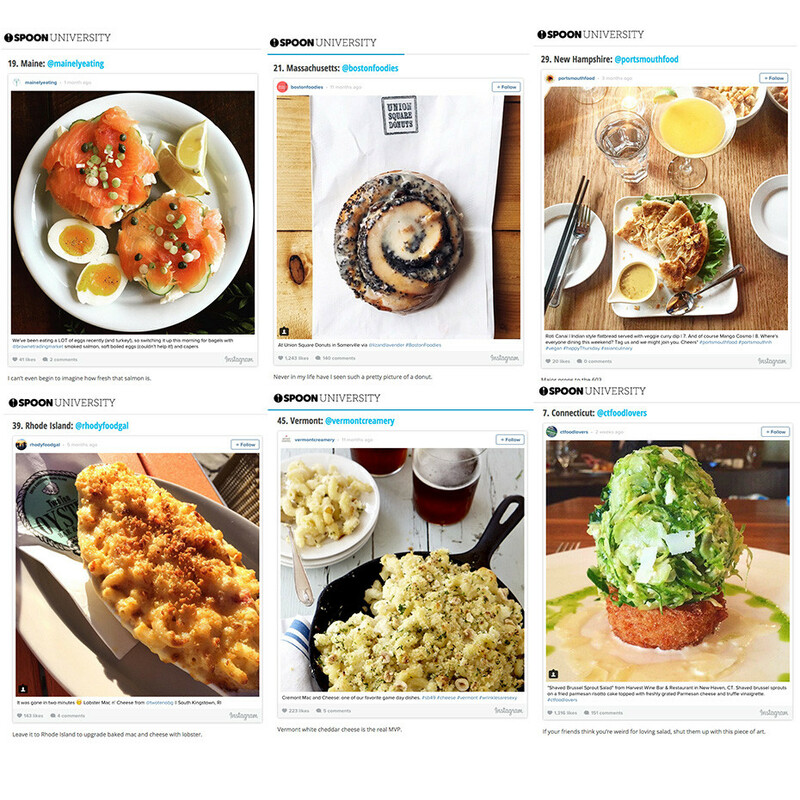 Leave a note in the comments with your favorite cookbook! One of the hazards joys of having a home on a lake in Maine is how your popularity exponentially increases through the summer months. Friends who are radio-silent from November-April suddenly announce they’ll be “in the area and might stop by!” once the weather warms up. Kidding! We really enjoy having (invited) friends to visit and this is one of my go-to recipes when I want to serve something for brunch or even an afternoon snack but not spend the weekend resentfully cooking in the kitchen. 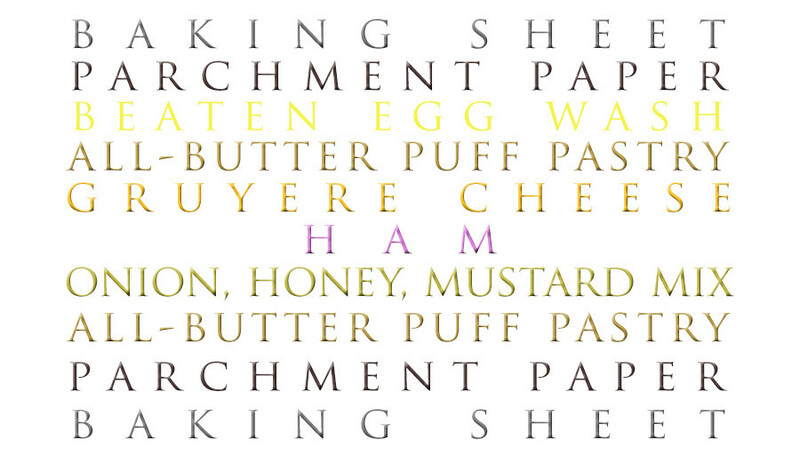 I call it a brunch pastry but the magnificent Chef Barbara Lynch (who created the original recipe) calls it “Ham and cheese puff-pastry bites with honey mustard”. It’s make-ahead so you can prepare the night before and your only job in the morning will be to pop it in the oven and mix up a batch of mimosas or bloody marys. Chef Lynch writes that this is the one time you want to splurge on the more expensive Dufour puff pastry vs. the cheaper (and not as buttery) Pepperidge Farm and she’s 100% right. 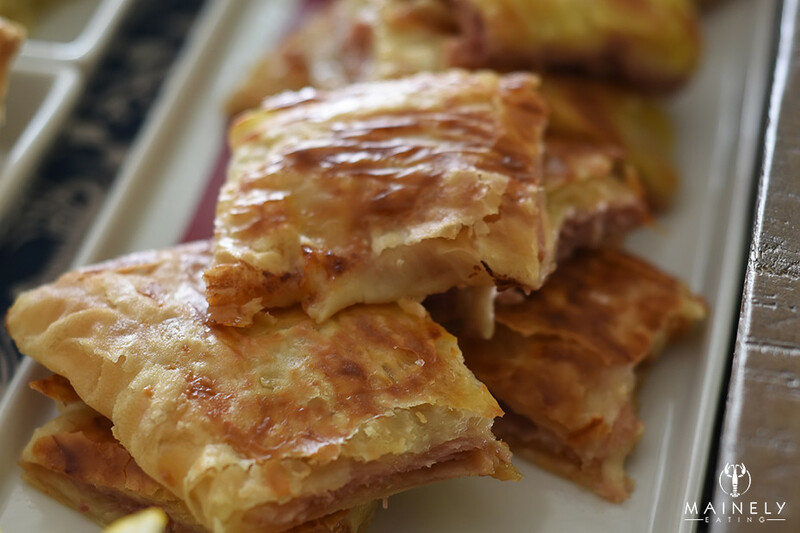 You’ll roll out your first sheet of puff pastry and spread it with a tangle of caramelized onions in honey and mustard. Chef Lynch recommends blitzing the mixture but I like the texture of the onions. 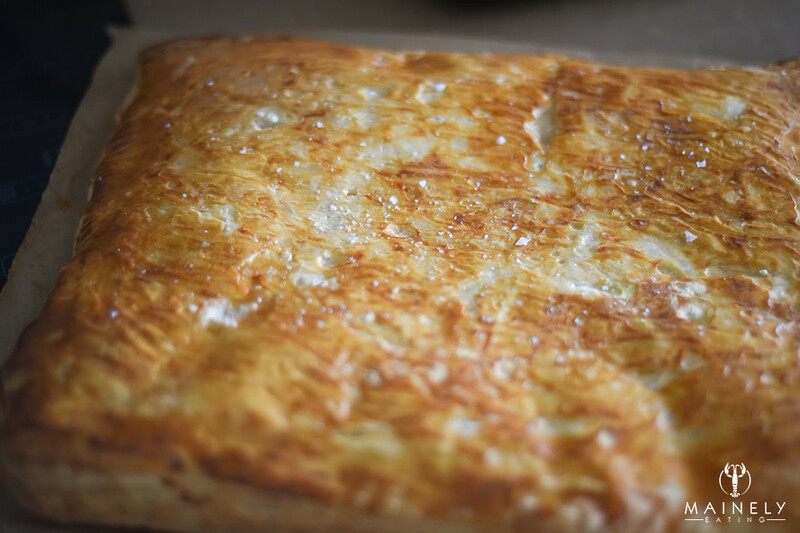 These pictures were from the first time I made the pastry and I now increase the quantities of the onions – they’re so good (recipe at the end of the post). If you were really, really pressed for time or just being lazy, you could skip this part and just spread with a little store-bought honey-mustard. 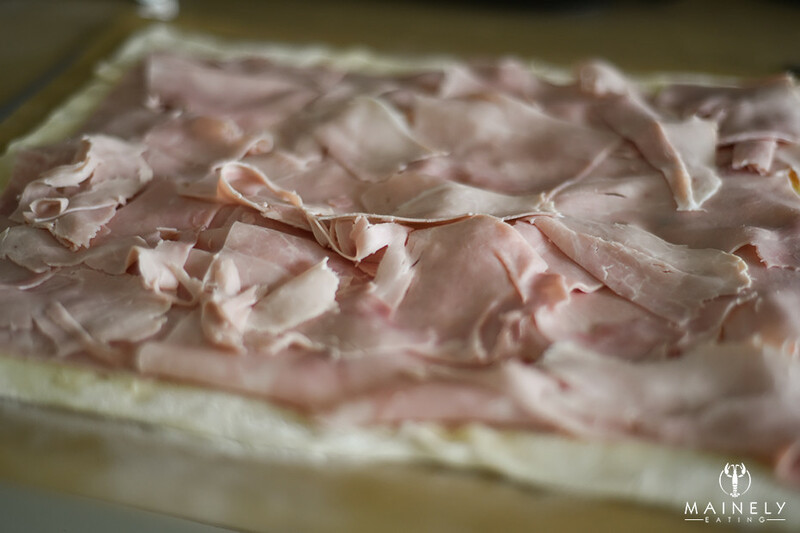 Cover the ham in grated gruyere cheese and then use a little egg wash to seal the top piece of pastry in place. Leave to cool for a few minutes and then cut into tasty little squares. It’s a rich and decadent little pastry so 2-4 bites per person is just right. You’ll also want a supply of napkins on hand if you’re entertaining or you can just lick your fingers if you’re alone! And although it’s the best brunch recipe, it would be equally as good if you were doing cocktails and hors d’oeuvres in the evening. You’ll need 2 flat cookie sheets and parchment paper. Make the honey-mustard-caramelized onion mixture. Over a low heat, cook the onion in the oil and butter.for at least 30-60 minutes. The longer the better. Keep the heat low enough that the onion doesn’t brown prematurely. Add the honey. mustard and a little salt and pepper to the onions. Set aside to cool. Roll out the first sheet of puff pastry on a piece of (lightly floured) parchment paper. Slide this onto the baking sheet (the paper should be between the baking sheet and the pastry). Spread the pastry with the onion/honey/mustard mixture. Important! Leave a 1 inch border around the edge. 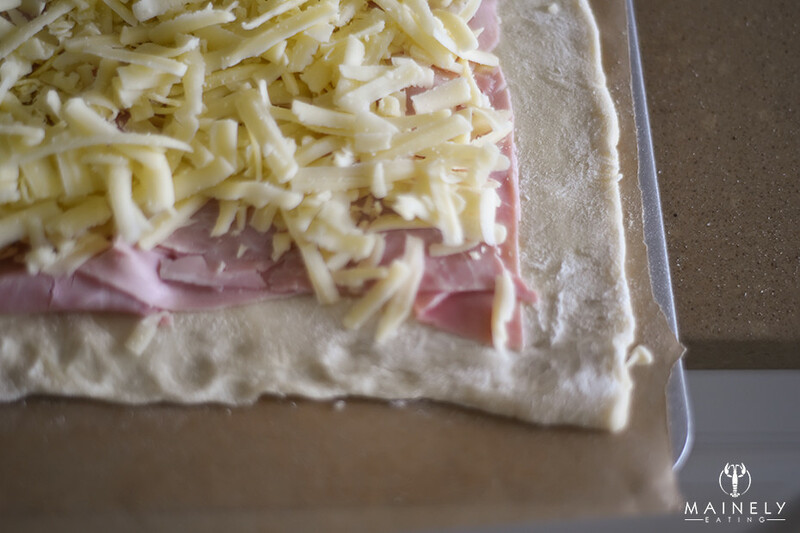 Cover the ham with grated gruyere cheese – remember to leave the border clear again so you can seal the pastry later. Roll out the second layer of pastry on another piece of (lightly floured) parchment paper. Brush the border with the beaten egg, don’t throw away the remaining egg. 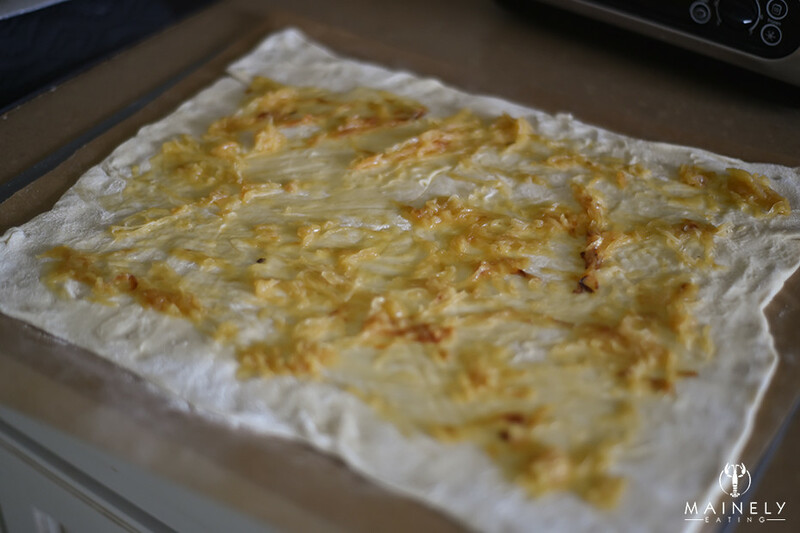 Take the second layer of pastry (on the parchment paper) and carefully flip it over (the paper should be on top – this is a ham and cheese pastry, not a ham, cheese and paper pastry!). Gently press down on the border with your fingers (the egg wash acts like glue to stick the two pieces of pastry together) and then use the tines of a fork to give it an extra seal. If you’re making ahead, this is where you’d stop, collaborate and listen cover the pastry on the baking sheet with saran wrap making sure it’s tightly wrapped so it doesn’t dry out. Brush the top of the pastry with the remaining egg wash and sprinkle with a little Maldon sea salt. Then – don’t skip this step or your pastry will balloon alarmingly – lay a piece of parchment paper on top of the pastry and cover with the second baking sheet. This will weigh down the pastry and prevent it from puffing up too much. If you’re getting confused with the layers, there’s a picture guide at the end! Bake at 375 degrees for 25 minutes, then remove the top baking sheet and bake for an additional 10-15 minutes until the top is a perfect golden brown. Leave to cool for a few minutes and then cut into tasty little squares. If you don’t have a copy of Barbara Lynch’s book “Stir” then you should stop whatever you’re doing and order it RIGHT NOW. Click on the thumbnail below to get your own copy (affiliate link). 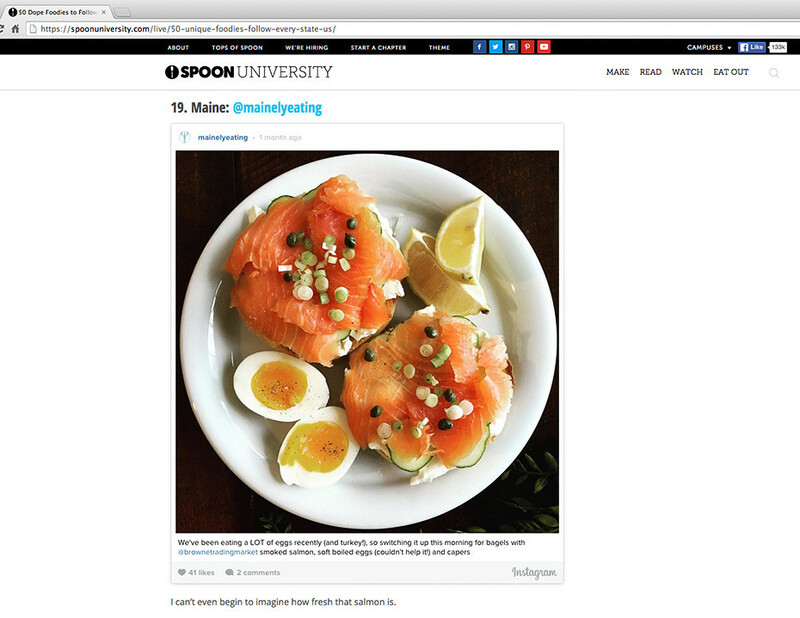 Thanks to Spoon University, Mainely Eating was just listed as one of “50 Dope Foodies to Follow From Every State in the US” This might be the first time I’ve ever been described as dope and it’ll probably be the last but I’ll take it.